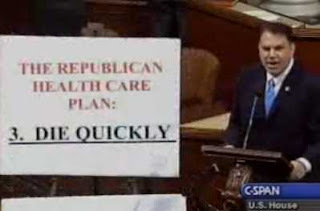 When Democratic firebrand Rep. Alan Grayson (D-FL) made his famous statement on the House floor that the Republican health care plan was "If you get sick, die quickly," the right was angry as hell at the characterization. Though the GOP offered absolutely nothing in terms of a new approach to health care, and spent all of their time and energy lying about what the Democrats were proposing, they insisted that their "ideas" would best deal with both the costs of health care and the access to it. Today, at the "Values" Voter Summit, 2012 Presidential hopeful Mike Huckabee said out loud what everyone knows the Republicans already think. If you have a pre-existing condition, and can't get insurance, screw you. Tough luck about that cancer. Huckabee compared cancer survivors and others with pre-existing conditions to a burned down house, and said that they don't get health insurance. The crowd roared. "It sounds so good, and it's such a warm message to say we're not gonna deny anyone from a preexisting condition," Huckabee explained at the Value Voters Summit today. "Look, I think that sounds terrific, but I want to ask you something from a common sense perspective. Suppose we applied that principle [to] our property insurance. And you can call your insurance agent and say, "I'd like to buy some insurance for my house." He'd say, "Tell me about your house." "Well sir, it burned down yesterday, but I'd like to insure it today." And he'll say "I'm sorry, but we can't insure it after it's already burned." Well, no preexisting conditions." So, there you go. The Republican death panel. If you get sick, die quickly. Grayson was right. I really don't have the time or energy to go and get all of the data for you again, but even the more honest Democrats admit that there will be rationing of care (death panels), there will be increased costs, and the GOP did indeed have a VERY detailed plan in how to prevent both things from happening. Actually it is you who are being disingenuous since the system you praise already has death panels, has for decades, and you have no issue whatsoever with an insurance company bureaucrat making decisions about your health instead of your doctor. Also, under your status quo scheme, where private insurance monoliths make all heath care decisions, what are people with pre-existing conditions supposed to do for care? Under your plan, it is to die quickly. Sorry, but when your side had a chance to be a part of health care reform, you decided to play politics instead. You spent so much time lying about what was in the plan, that you clearly have no idea what is actually in there. There was no serious Republican plan, as they refused to participate. Those are the facts, not some teabaggin' revisionist history.